When the time came for the flinging of colors and burning of Holika, the temple priest counted down from 20. Hundreds of students waited in anticipation to throw colors at their friends. 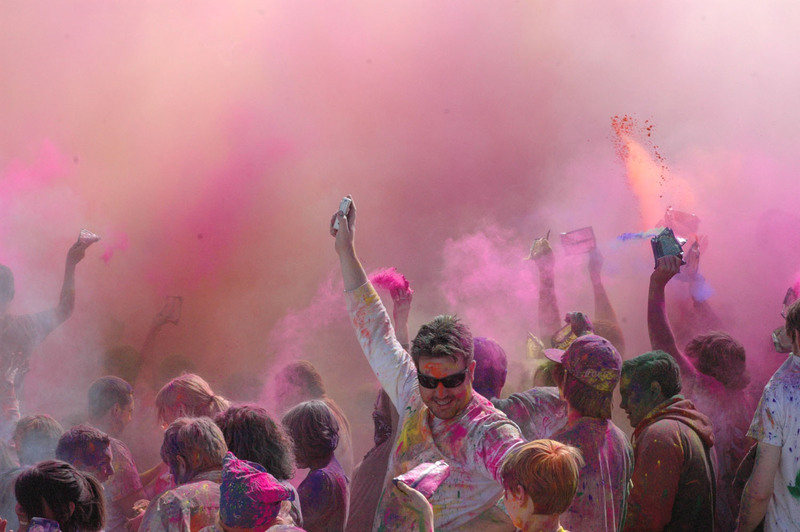 When the countdown came to one, everybody threw their powder and the temple grounds erupted into a storm of colors. As the dusty air cleared, people were covered in a mixture of pink, purple, yellow, green and other colors. Impatient people had already been dipping into their colors and smearing them on each other, but when the final countdown came, nobody came out from the cloud of colors untouched. With the end of winter and the dawn of spring comes the Holi Festival, also known as the Festival of Colors. Celebrated all over the world by followers of Hare Krishna, it is one of the largest and best known Hindu holidays. 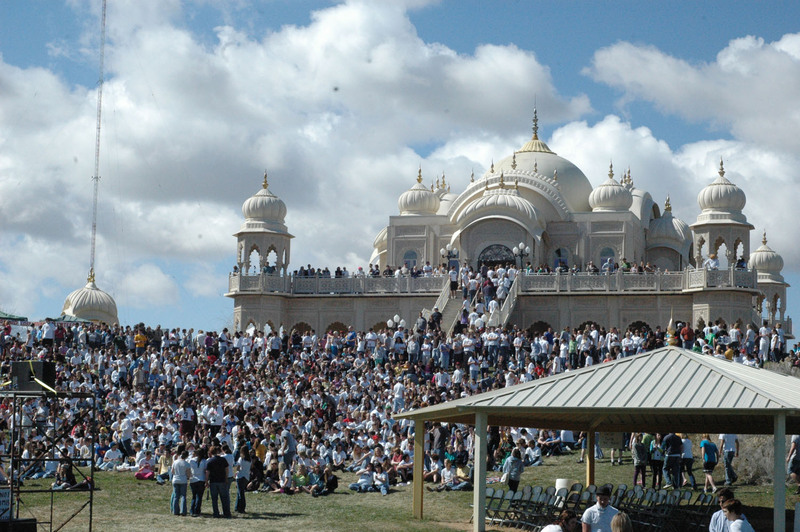 In Utah, it is celebrated at the Lotus Krishna Temple in Spanish Fork. Many people, who are not even Hindu, come to celebrate the changing of the seasons with traditional Indian festivities. All are invited, especially college students looking for a fun Saturday afternoon. Caru Das Adikari, the temple priest, said that the festival celebrates diversity. As the master of ceremonies, he got up on stage and described the origins of the festival. He told the Hindu story of Holika the witch who was immune to fire and would take babies with her into the fire and burn them. One day she took a boy named Prahlad. This boy was a devout follower of Krishna, and prayed every day. So when Holika took Prahlad into the fire, Krishna protected him and it was the witch who burned to death in the fire. Caru said if you put your faith in God, he would always have your back. Traditionally the festival is celebrated by burning an effigy of Holika. The throwing of colors is the main event of the festival. The colors are a dyed flour, which is imported from India. This year 20,000 people attended the festival, about double that of last year. Last year’s turnout forced the temple to conduct two separate festivals, one in the morning and another in the afternoon. Caru said only 500 Indian families live in the Utah Valley, and even fewer who regularly attend the temple. “Horizontally, meaning the people around you, and vertically, meaning with God,” he said at the festival. He said it is known as Brigham Young University’s spring break. “It is so integrated on BYU, that all you need to do is tell one person on campus the date, and within 40 minutes, everybody knows,” he said. Caru conducted a poll among the attendees, and discovered 35 percent to 40 percent of the attendees were BYU students. “At first people will feel uncomfortable, but you look around and you see everyone is having a good time and no one is taking themselves seriously,” he said. The festival is said to have been celebrated for 5,000 years in India and was started by Krishna himself, Caru said. The celebration is on a much bigger scale in India and a lot less organized. It is at such a scale that people will be throwing colors in the streets, at friends and strangers alike. Caru was born Christopher Warden in New Jersey. In 1969 he traveled to Sydney, Australia, where he visited the Krishna Temple regularly and later became a member of the International Society for Krishna Consciousness. He returned to America in 1975 and traveled the country spreading Krishna Consciousness. According to an essay by BYU student Chad Young, the Utah temple was established by Caru and his wife, Vaibhavi, in 1987. That year, he bought an old AM radio station along with an acre of land in Spanish Fork so that he could conduct a Krishna themed radio station and start a temple. The temple started off in a smaller building, but a newer, more traditional temple was built in 2001 next to the old one. Ever since, they have been maintaining and living on the temple grounds, sharing Krishna culture and traditions such as Holi Festival with Utahns. “The temple is more of a tourist attraction, we don’t really go around converting one or two people, but we try to spread awareness throughout the area,” Caru said. On stage, Caru mentioned that the first Holi Festival in Utah 12 years ago only had about a dozen participants throwing colors at one another and chanting together. Caru said one of his favorite aspects of the festival was the massive chanting of Hare Krishna. “Saying the name of God, effectively gets you closer to God,” he said. People who go to the festival usually return, Caru said, and each time they do, they gain a greater understanding of what the festival is about. “If nothing else they take away the Hare Krishna mantra, ringing in their ears for days,” Caru said as he laughed. The festival featured performers such as the band Mantra Rock and a troupe of traditional Indian dancers, Shatakshi Goyal. Inside the temple, attendees danced and chanted to the rhythmic sounds of India. Participants respected the traditions of the temple and removed their shoes before entering the temple. People who attended the festival were treated to fresh orange juice and could purchase authentic Indian cuisine such as curry with rice. Brooke Richmond, a sophomore from Utah Valley University, said her roommates dragged her out to the festival. At first she didn’t think it would be fun, but when she got there, she got into the spirit of things. “I’m definitely going again next year,” Richmond said. Hilary Dalton, a senior from Hillcrest High School, said it was her second year attending and it gets better every year. “I love the atmosphere and vibe of the whole gathering,” Dalton said.